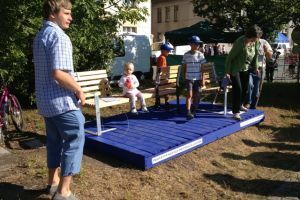 “Mobiliář” – furniture of the public space. In Vodňany, there is a brand new set of original benches – “molovička, stolovička, židlovička, seslička, dvojlavička, křeslovička”. The co-author architect Jakub Chuchlík presents what is a story behind their origins; what trail connects them now.